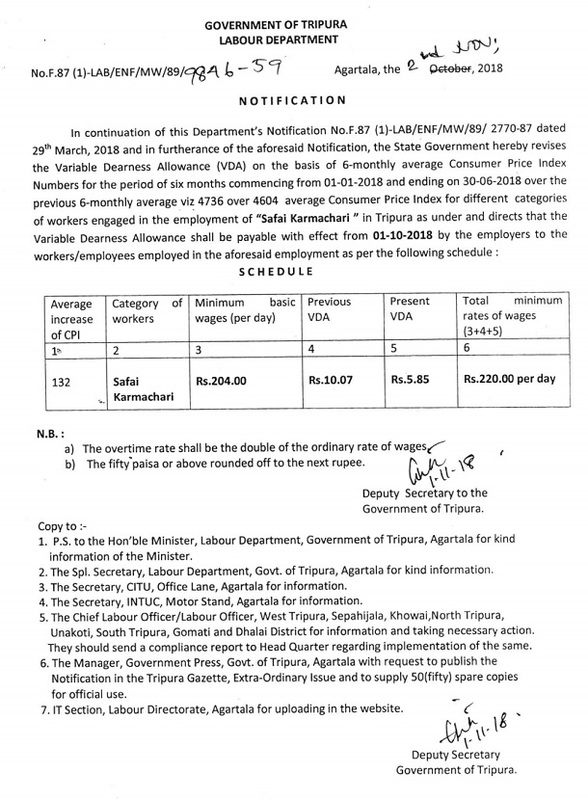 AGARTALA, Dec 5 (TIWN): JUMLA promise of Rs 340 minimum wage now turned another FAKE promise as State Govt ordered only Rs 220/- for safai karmacharis. JUMLA Party’s chieftains Modi, Amit Shah, Himanta Biswa to Biplab proved beyond doubt that fooling masses via FAKE promises before Elections are BJP’s Election winning formula. Instead of HIRA, Tripura is now affected with poll-violence, attack upon the opposition even fourth pillar of democracy is gripped by corruption. Right now massive election rigging, attacks on opposition, police personnel going on, whereas Home Dept under Chief Minister Biplab Deb left with zero action against law violators. 9 months have been completed that BJP Ministers, CM took oath at Agartala Assam Rifles ground and for one month long celebrations continued after people got a new Govt with the downfall of 25 years of Communist citadel. But when state was waiting for increase in wages, regularization, employment BJP Govt started its Jumla-stunts by stopping job recruitment followed by cancellations of ongoing all recruitment and removal of Pension-facility for new Govt employees. In last 9 months 56 times petrol price was hiked, whereas 52 times diesel price was increased and now petrol price still high than last year. On the other side, the State Govt employees are far from getting actual 7th Pay Commission, only got 0.25 factor hike, whereas July month's DA is yet pending. Whether Govt will give the DA to employees or not, nothing has been said in this regard. Over 800 contractual employees were terminated including poor mid-day-meal workers. There is a massive slash in MGNREGA works and rural areas are suffering due to no workless conditions, whereas even though under Manik Sarkar's regime even though two types of govts were ruling in centre and state but still Govt managed a minimum fund to uphold the rural economy.